Today theSun run two stories on the Malay movie Tombiruo, based on best seller novel with the same name . The first story centers on the film production while the second story focuses on the author. Adapted from a bestselling Malay novel by Ramlee Awang Murshid the story centres on a man named Tombiruo, who lives in the forest with his adopted father Pondoluo. Tombiruo, who wears a wooden mask to hide his disfigured face, has a strong connection with the forest, and is considered its protector, complete with magical powers. When a logging company gets the job to clear a part of the forest for the building of a dam, the company sends in some hired thugs to drive away the local aboriginal community who opposes the project. Tombiruo and his father try to help the villagers, and in the struggle, Pondoluo is killed. The thugs escape, leaving a devastated Tombiruo swearing revenge upon them. two directors – Australian filmmaker Seth Larney and local actor-director Nasir Jani as associate director. Abu Bakar and Zainir Aminullah dismissed the notion that hiring a foreign director is a sign that Astro lacks faith in local directors. “We wanted to elevate the Malaysian film industry by pairing a very good local director (in Nasir) with a very good foreign director (in Larney),” said Najwa, who is also head of Astro Shaw. films would help Tombiruo appeal to a global audience. “We are looking at markets where our movies have not gone before,” he added. Interestingly, both directors were not present for the press conference after the screening of Tombirou. There were rumours of tension between Larney and Nasir, and I could not help but speculate there might be some truth to them. Then again, I could be wrong. Perhaps, both directors were just too shy to meet the Malaysian press. on the set, and the film shoot was smooth sailing. He also applauded Astro’s move to encourage a collaboration between a foreign director and a Malaysian director. “Our football team imports foreign players to become better,” Farid said. Chen, who plays the film’s antagonist, agreed. “When I got the role, I did not know the film would have two directors,” said Chen, who is also a film producer and active in the Malaysian theatre scene. At the start, he was worried that the film might face some rough patches. But he was wrong. “I never had a better experience on a film set, and [it] was awesome,” he says. About 10 years ago, author Ramlee Awang Murshid mstarted a film production company, Layar Sunan, hoping to adapt his novels into films. Tomorrow, the 50-year-old’s dream will come true. The film adaptation of his best-selling novel Tombiruo: Penunggu Rimba will be released in cinemas.The film is produced by Astro Shaw, with the cooperation of Layar Sunan. 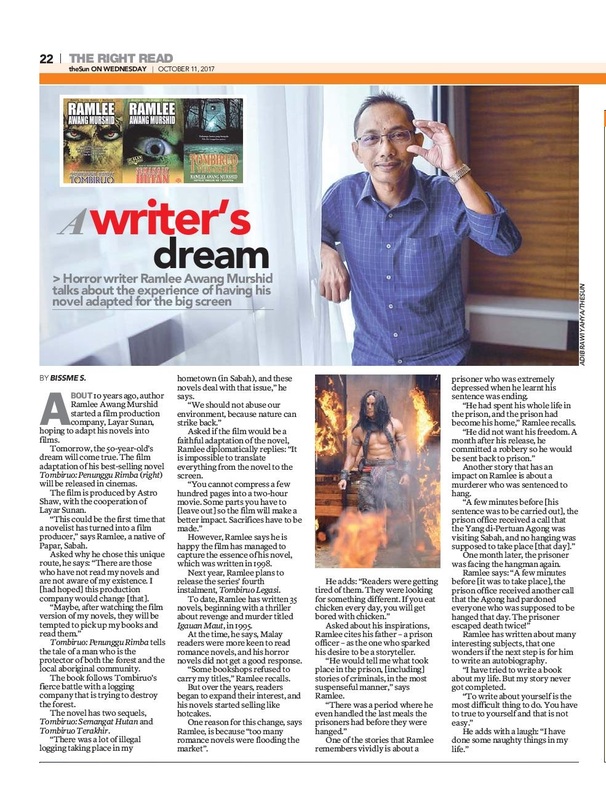 “This could be the first time that a novelist has turned into a film producer,” says Ramlee, a native of Papar, Sabah. Asked why he chose this unique route, he says: “There are those who have not read my novels and are not aware of my existence. I [had hoped] this production company would change [that]. Tombiruo: Penunggu Rimba tells the tale of a man who is the protector of both the forest and the local aboriginal community. The book follows Tombiruo’s fierce battle with a logging company that is trying to destroy the forest. The novel has two sequels, Tombiruo: Semangat Hutan and Tombiruo Terakhir. However, Ramlee says he is happy the film has managed to capture the essence of his novel, which was written in 1998. Next year, Ramlee plans to release the series’ fourth instalment, Tombiruo Legasi. To date, Ramlee has written 35 novels, beginning with a thriller about revenge and murder titled Igauan Maut, in 1995. At the time, he says, Malay readers were more keen to read romance novels, and his horror novels did not get a good response. “Some bookshops refused to carry my titles,” Ramlee recalls. But over the years, readers began to expand their interest, and his novels started selling like hotcakes. One reason for this change, says Ramlee, is because “too many romance novels were flooding the market”. Asked about his inspirations, Ramlee cites his father – a prison officer – as the one who sparked his desire to be a storyteller. “He had spent his whole life in the prison, and the prison had become his home,” Ramlee recalls. Ramlee has written about many interesting subjects, that one wonders if the next step is for him to write an autobiography.